From the unique perspective of a nationally respected, mature physician, Dr. Sheff reflects deeply on the formative experiences of medical school and residency, giving the reader unexpected insights into the heart and mind of doctors, the experience of patients and their families, and ultimately the connection between love, medical practice, and the healing we all seek. The unique stories in Doctor Confidential speak directly to anyone in medical training or considering a career in medicine, but also to the patient in all of us. 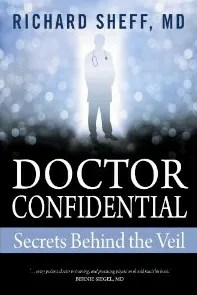 Pulling back the veil of secrecy that too often surrounds medicine, Doctor Confidential provides compassion, humor, and ultimately hope that, when sick and most vulnerable, each of us can be heard, understood, and deeply touched by our physician. INSPIRATIONAL MEMOIR TO GIVE AWAY. RETWEETED THIS GIVEAWAY (LEAVE LINK). Yes, I have considered it. My father was a doctor. I follow your blog publicly with Google Friends Connect. I follow you on Twitter. My Twitter name is Carolee888. I did at one time but was afraid I wouldnt be able to deal with seeing all the suffering and pain of people. I have been a registered nurse since 1973. Blood makes me squeamish, so that's not for me. I'm following on GFC w/ @headlessfowl. headlessfowl at gmail dot com. I thought about becoming a nurse at one time. I would love to work in the medical field but going to school right now is out of the question! I would love to be a nurse, but I can't stand the sight of blood. I work in Physical Therapy and thought this would be a good read. Thanks so much. I wanted to be a pediatrician when I was but a lad. Yes, I have thought I would love to be a home health care nurse for children when our daughter was sick and we had this home health care nurse coming to our home to care for her. I follow on gfc as degood. I actually considered going to medical school but then I figured out that I'm lazy. I've worked in the Mental Health Field and enjoyed it. Working as a Nurse or Doctor I could not handle that.